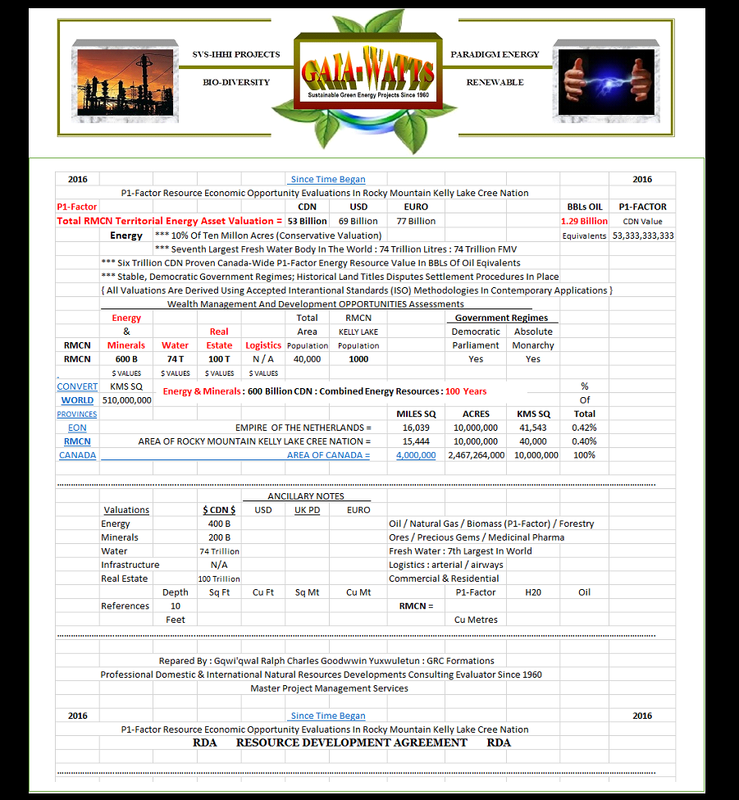 And, it has arisen that citizens of the Two Turtle Islands (North / Central / South America) have collated a series of individual personal land title claims into an assembly of Joined Claims. 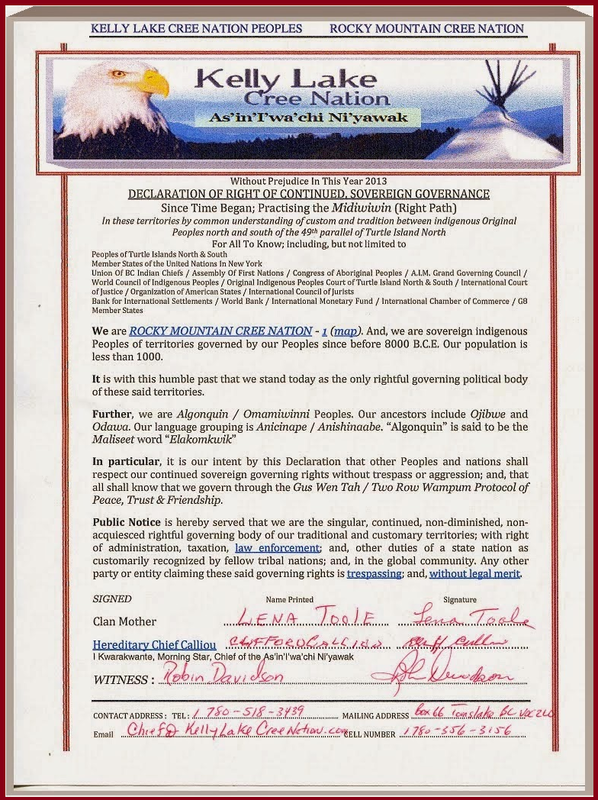 This CSSP Joined Claim arises through the Allodial title collection of the 3 million customary and traditional indigenous consecutively settled sovereign Peoples of the EIIR Canada Ship occupied territories as an origination Proclamation and Prosecution; and, there is a prevailing 15 million total Turtle Island North populace entitled to petition to be included into this claim. Decolonization through just and good cause is predicated through the historical assault upon the indigenous Peoples customs and traditions. Free Prior Informed Consent is the crux of breaches to human, civil; and, political rights. 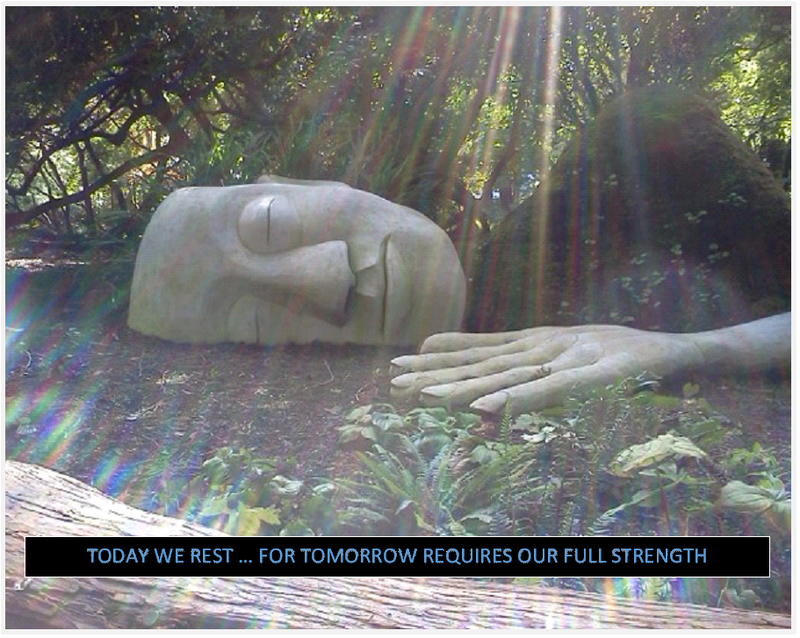 It is time to abandon the customary collateral damage ethic; and, rehabilitate reverse onus. And, in conjunction with this political, civil and human rights amelioration with common sense and social justice, is the adjudication of land and resource title ... 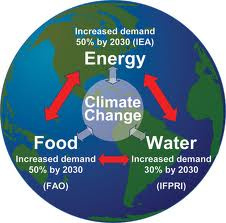 i.e., allodial title in conjunction with formation of governance. 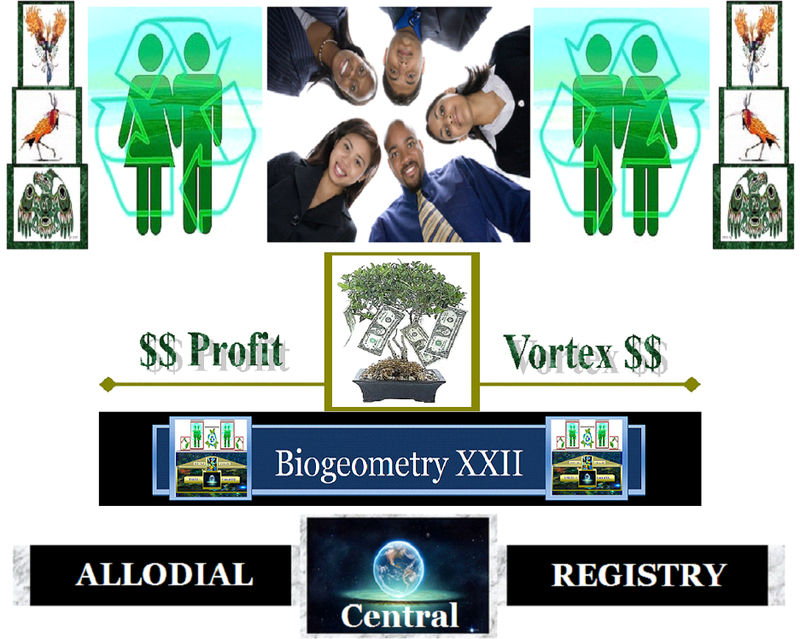 The CSSP (Consecutively Settled Sovereign Peoples) are not aligned with the United Nations; nor, with of the standard banking / financial networks (B.I.S. 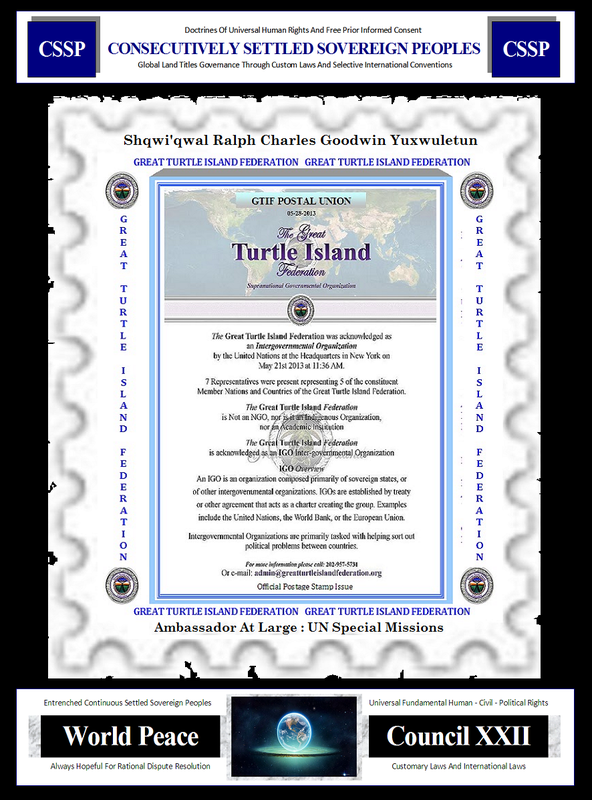 / World Bank, NATO, IMF, IEA); however, the United Nations did receive and acknowledge an IGO Great Turtle Island Federation in 2013; and, in 1923, the Haudenosaunee emissary, Chief Deskaheh, did attend the League of Nations convening in Switzerland to file notice of CSSP governance paramountcy contrary to the United Kingdom and the emerging EIIR Canada nation. The Deskaheh delegation was denied (by UK and Canada) to gain formal attendance. 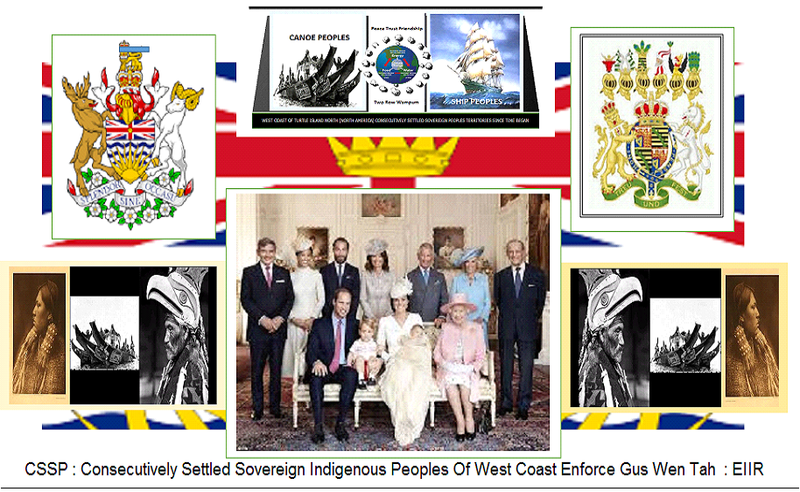 This UK / Canada subterfuge was an historical political, military and trade conspiracy contrary to custom and traditional CSSP paramount governance of Turtle Island North. The Holy See's mid-fifteenth century non-redeemed Papal Bulls Inter Caetera and Romnus Pontifex predicated these matters upon all royal lineages and government institutions under the Roman Catholic Church domain by stipulating that all lands and resources not within the Roman Catholic Church (RCC) were not occupied by humans; and, therefore, rightfully subject to colonization (which required RCC inclusion). 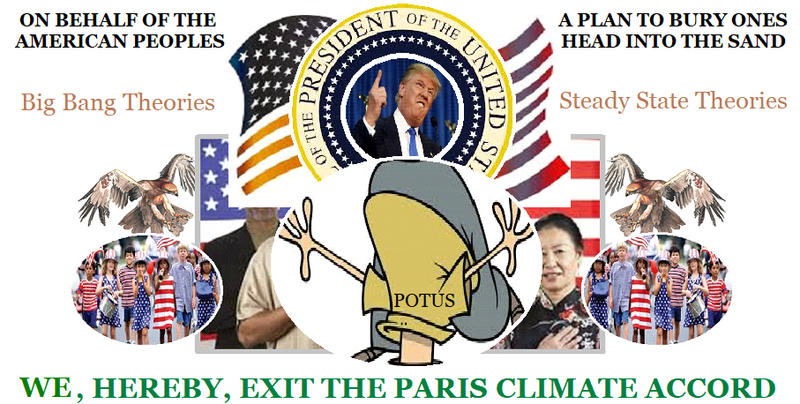 These RCC Papal Bull demands were non-refutable. 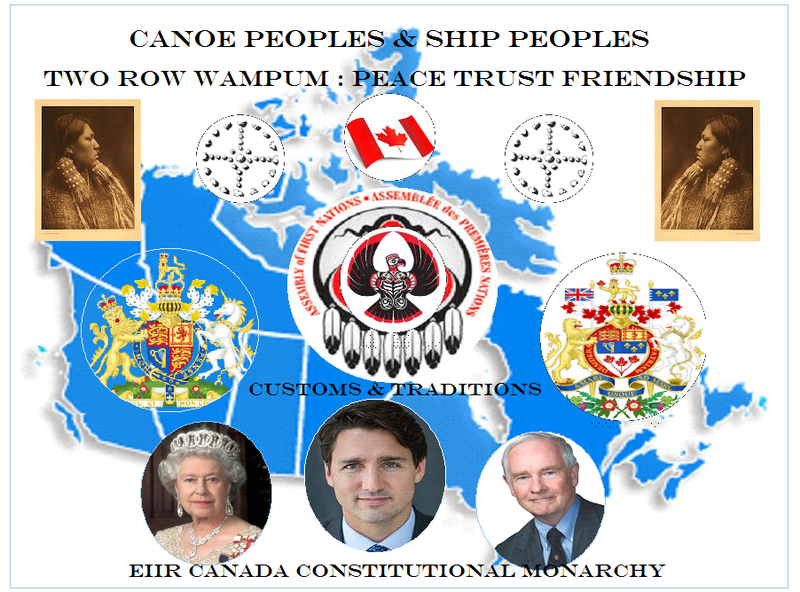 It is critical to understand the veracity of paramount governance rights of Canoe Peoples versus Ship People - which includes the conditional landing rights of the United Nations New York, USA HQ. 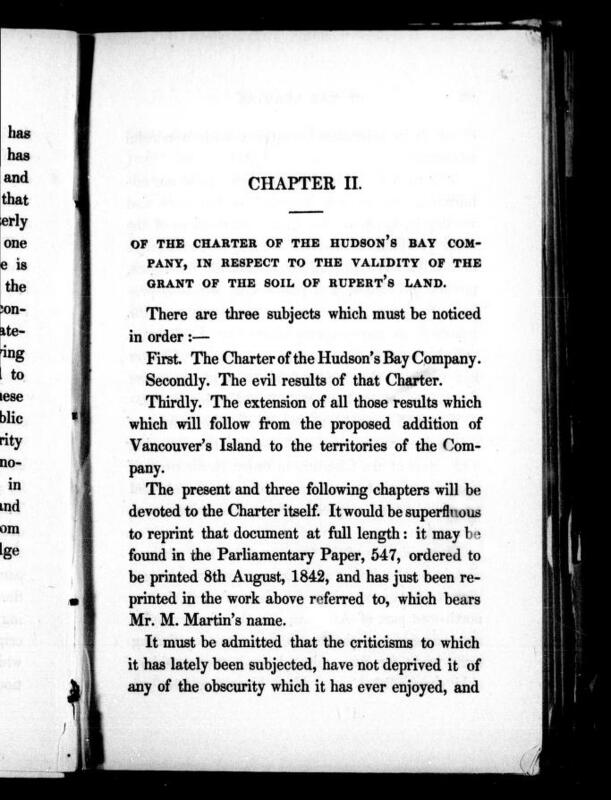 And, within this context, the Charles II's Hudson's Bay Company Charter and the gift to his cousin of "Rupert's Land" must be viewed with ultimate regret as being null and void - the HBC Charter only authorized trade agreements; and, specifically prohibited HBC from acquiring lands and / or resources (HBC sold its accumulated lands to the Canada founding fathers in 1867) ... see additional references below ... note : Union of BC Indian Chiefs / UBCIC detailed "Stolen Lands - Broken Promises". The UN Special Indigenous Peoples' Rapporteur James Anaya's Report on EIIR Canada detailed evident human, civil and political breaches upon CSSPs by EIIR Canada. 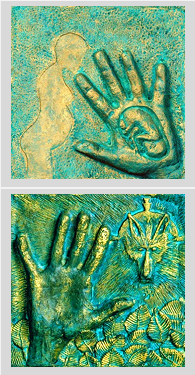 Allodial title originates through the individual's relationship with the Creator; and, establishes the fundamental stewardship relationship. The Allodial Title Registry has collected individual statements of customary and traditional land and resource title across Turtle Island North since before 1995; and, has informed the international community (including, the United Nations). Following the British Empire adoption of the Church of England to succeed the Catholic Church as the central faith institution; there arose the Acts of Supremacy as adjuncts to the original Terra Nullius Papal Bulls. Hence, the royal instructions to merchant enterprises venturing in search of a new route to China were based upon the ignorant holding that the prevailing since before 10,000 years B.C.E CSSP inhabitants of Turtle Islands North & South were not "humans" by reason of not possessing faith through the Christian institutions. See Lawyers Rights Watch : The Gap. There are several significant case decisions in Canada that are demonstrating an emerging "re-think" by the courts regarding CSSP land and resource governance entitlements (again, reverse onus principles : CSSP required to prove rights). 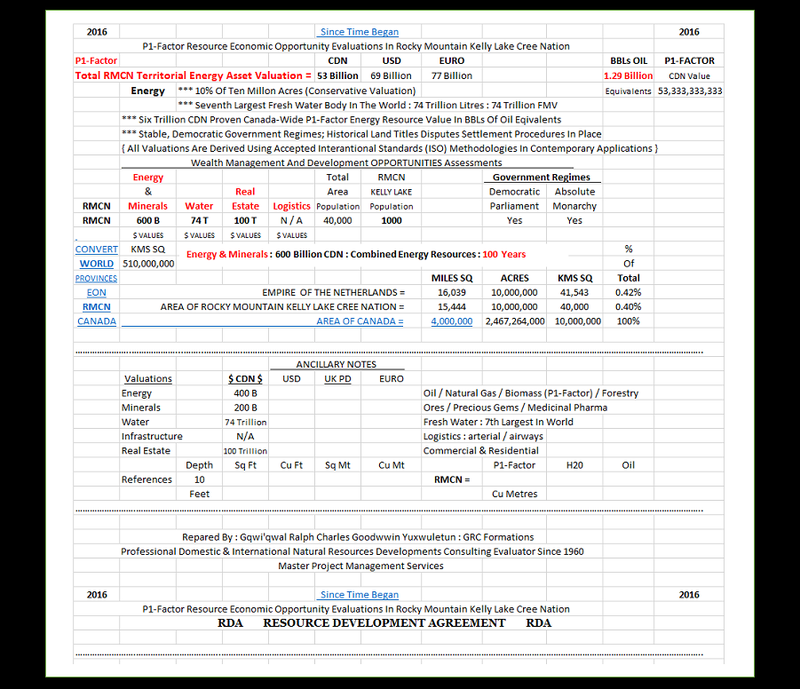 The SCC Bastien Estate decision regarding financial rights and the SCC Tsilhqot'in Nation land recovery settlement are prominent indicators of emerging CSSP success before the EIIR Canada Ship's courts. 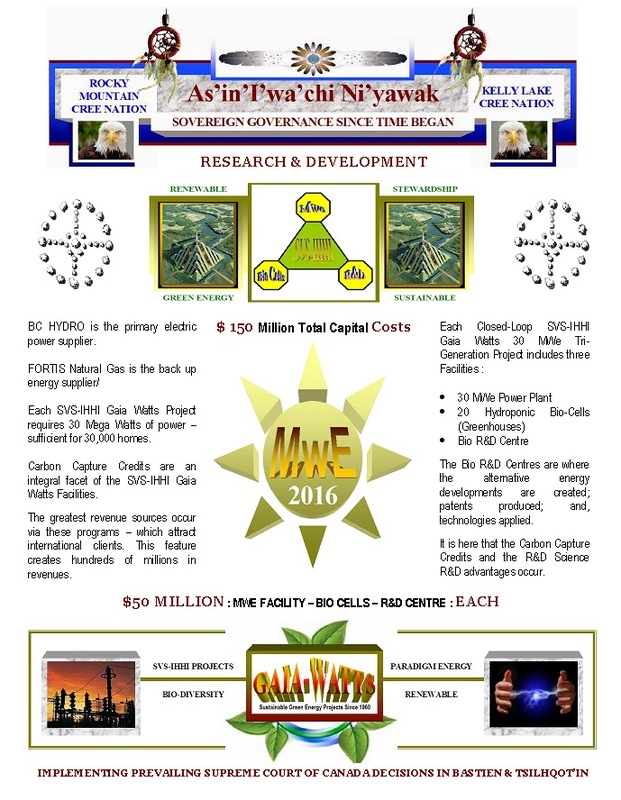 And, it is with similar vigor that Kwa'mutsun Nation continues to prosecute EIIR Canada for Crimes Against Humanity And War Crimes; which have arisen and continue in breach of Gust Wen Tah Covenants ... sustaining its absolute monarchical paramount governance allodial land and resources land claim within this process as it advocates its charges through the International Indigenous Peoples Court. Continued legal expenses are a constant challenge; and, CSSP consider such international cases as the Airey vs Ireland to be leading indicators that - in the matter of CSSP vs EIIR Canada - that it shall be the "Ship's" burden to finance all CSSP court advances, being that this"Crown" is in evident breach of the EIIR Coronation Oath, Gus Wen Tah; and, inyernational laws, such as the UN Charter, Chapter VII provisions. This legal aid matter arises with legitimacy due to EIIR Canada Ship's standing that CSSPs are permanent "wards of the state" ... another confusing anomaly since indigenous CSSPs are named as "first nations". It is evident that EIIR Canada Ship continues to imprison an abnormally high ratio of CSSP - both men and women; most being prosecuted in absence of adequate state funded, competent legal counsel of choice. It is wise for EIIR Canada Ship to comply, post haste, with the legitimate CSSP Joined Claim citations; therein, establishing the Ice to Thaw options; and, the justified redistribution of wealth from the 1%ers to the general populace; as vested by the CSSP. Governance of the nation state; or, the defined territory, involves the political will of the citizens to accept certain boundaries for mutual benefit. Past and present practices by actors of the state and individual commerce and trade entities have established the claim foundation of the indigenous Peoples who now have assembled through a Joined Claim. 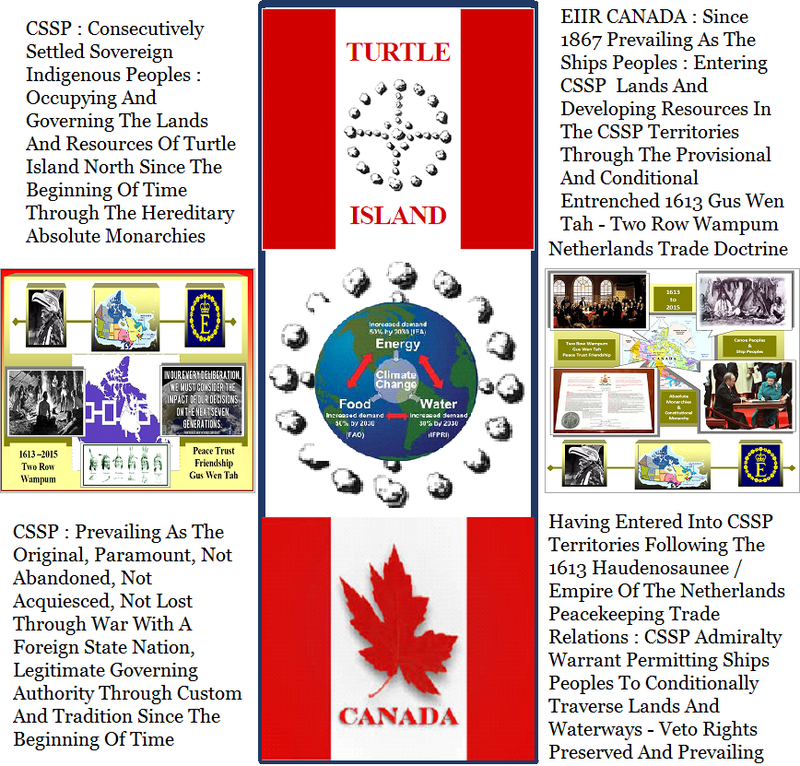 This Joined Claim includes the 3 million CSSP population of the EIIR Canada Ship occupied territories as the specific Declaration; and, forecasts that the eventual Turtle Island North Joined Claim will include the 15 million CSSP populace. The substance and political drive of the Joined Claim is detailed in the FPIC page : EIIR Canada Claims 150 Years Of Governance. 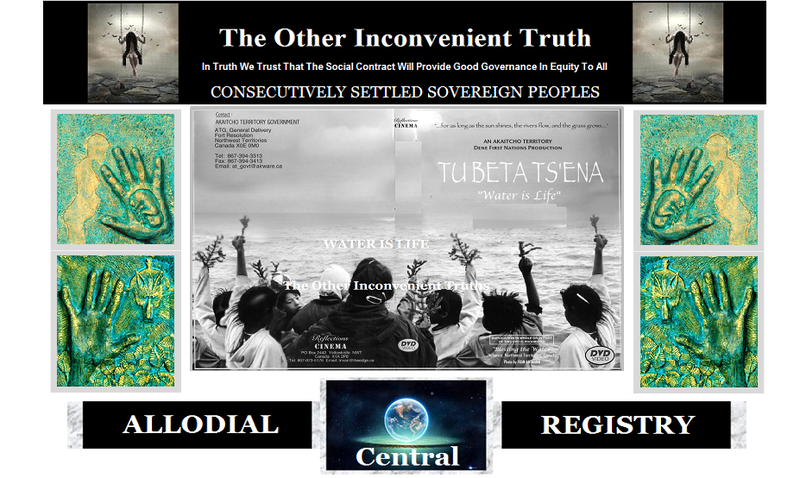 Evidence of the entrenched CSSP sovereignty has prevailed through international circles since 1613 by way of the world's oldest, continued nation-to-nation Haudenosaunee - Empire of the Netherlands trade agreement. 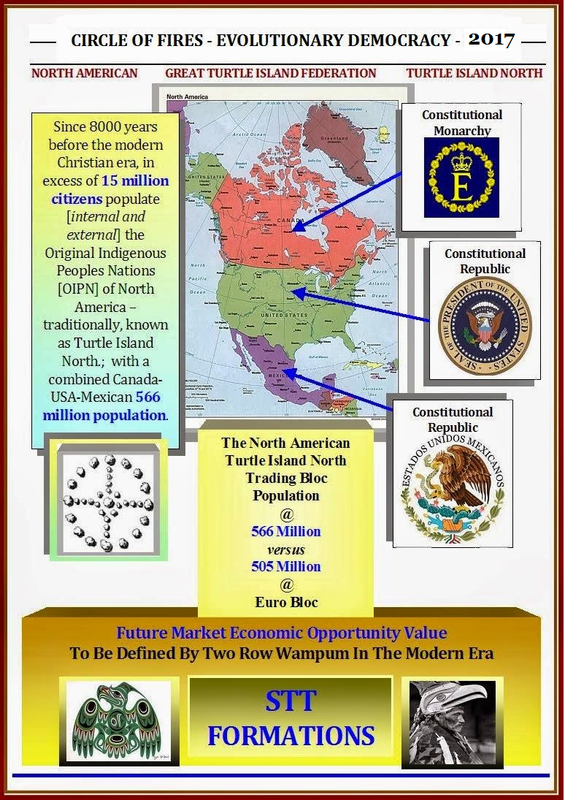 Eleven hundred CSSP nations exist in Turtle Island North (North America), contrary to the Holy See's Papal Bulls. Dispute Resolutions will occur within the New World Order, as Oversight illustrates. Domestic and international dialogues will be more inclusive. 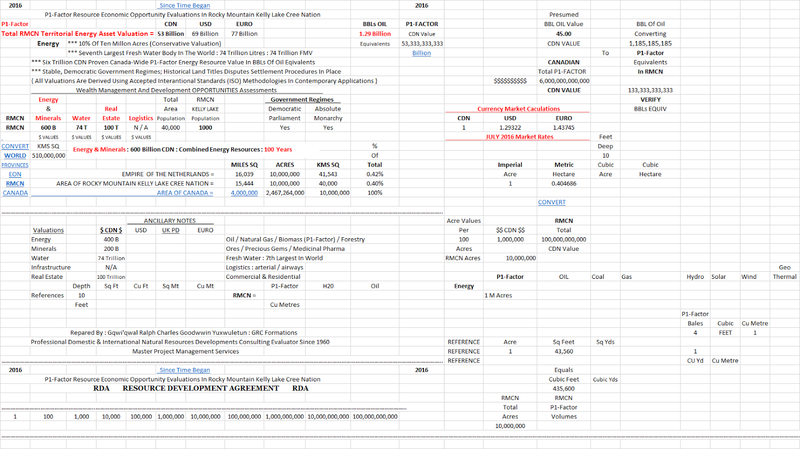 It is wise to consider the CSSP's taxosnet mission as a correction to the military industrial complex; especially, as within the "collateral damage" context. 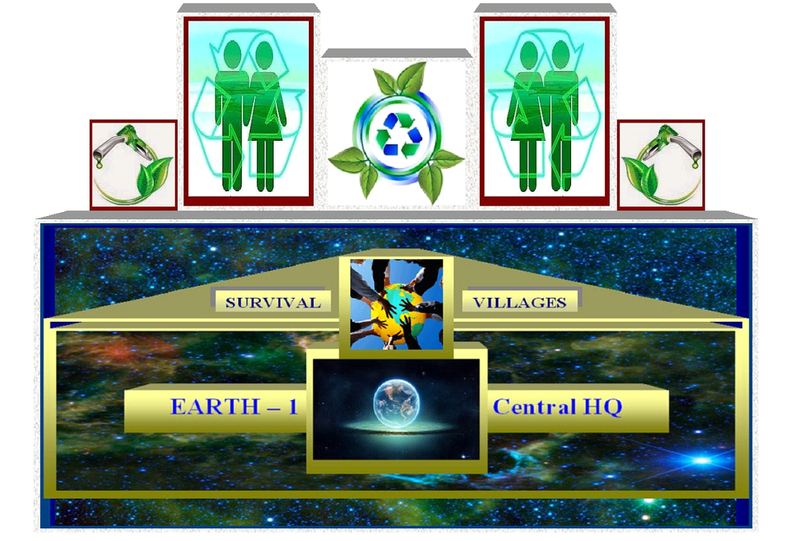 At the heart of the constant individual and general citizenry - who are in pursuit of human, political and human fundamental / universal rights - is the 1%ers Factor. 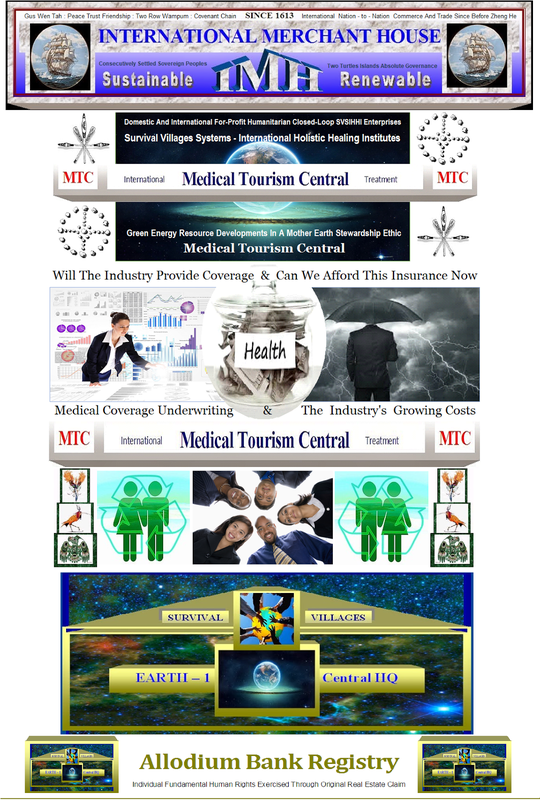 And, the apex mechanical and technical strategies that control the future commerce and trade (domestic & international GDP) are the financial providers : insurance companies, banks; and, the sophisticated private lenders / institutions. Malthusian/Darwinism capitalist doctrines; and, the socialist communist covenants are both at odds with the equitable social contract. In both instances there are the primary concepts that humans are basically non-productive except within a perpetual hardship environment. Hence, global warfare (macro and micro theaters). The constant domestic and international corporate mergers continue to absorb all commerce and trade into the Five Principal Mandates. The relevance of the aforementioned is that CSSPs are an example of "collateral damage"; just as "home children" were; and, is substantially similar to the 1.6 million Chinese Peoples who were deposed of their traditional lands as the government developed the Three Gorges dam facilities; or, the two million Peoples of India who were evicted from their lands in order that the sugar industry could acquire those fertile resources - and, which, today may be evident as landlords construct "renovictions" of residential tenancies ... All being factors of the "collateral damages" sufferance of citizenry victims; who are considered inconsequential to the machinations of the state. Hence, we return our conversation and report of complaint to the conspiracies that are created on behalf of the "1%ers" ... And, of which the CSSPs have determined is best to be "oversighted" by custom and tradition. Nation state governance is viewed as arising through the individual allodial entitlements; as then, evolved through free individual and group choice into the general societal governance structures. Allodial title cannot be lost through hostile, foreign military occupancy. 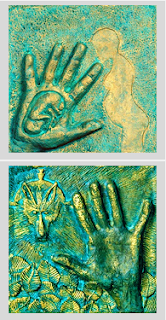 The doctrines and conventions of Free Prior Informed Consent are viewed through the lenses of the world's oldest, continued mutual interests Empire of the Netherlands and Iroquois Confederacy / Haudenosanee 1613 trade agreement; and, embraced through the principles of universal fundamental human rights. The integrity of the Haudenosaunee political governance leadership has been recognized by both the EIIR Canada and United States of America Ships in forming their individual founding political structures; wherein, both nations have invited, received; and, expressed gratitude to the Haudenosaunee delegations for the purposes of detailing the wisdom that has led to the Iroquoian continuous, peaceful confederacy since before the Zheng He expenditions, following the mesolithic era. Note : Petition to Revoke Inter Caetera. It requires 20-30 years, and $20-40 million for indigenous land titles disputes to wind through Canadian courts; and, consequently, the HTG vs Canada matters ascended to the IACHR in 2009 to commence the Hul'qumi'num' Peoples claim for return of 2 million acres of CSSP lands, Canada unsuccessfully challenged that there had not been an exhaustion of "internal remedies" before filing at the IACHR. However, the decision was to proceed (including considered supporting HTG amicus curiae briefs from Lawyers Rights Watch Canada and Amnesty International) wherein ICHR ruled that even when Canada's Supreme Court judged in favour of CSSP land title claims, that, thereafter, the Canadian government simply ignored the ruling. 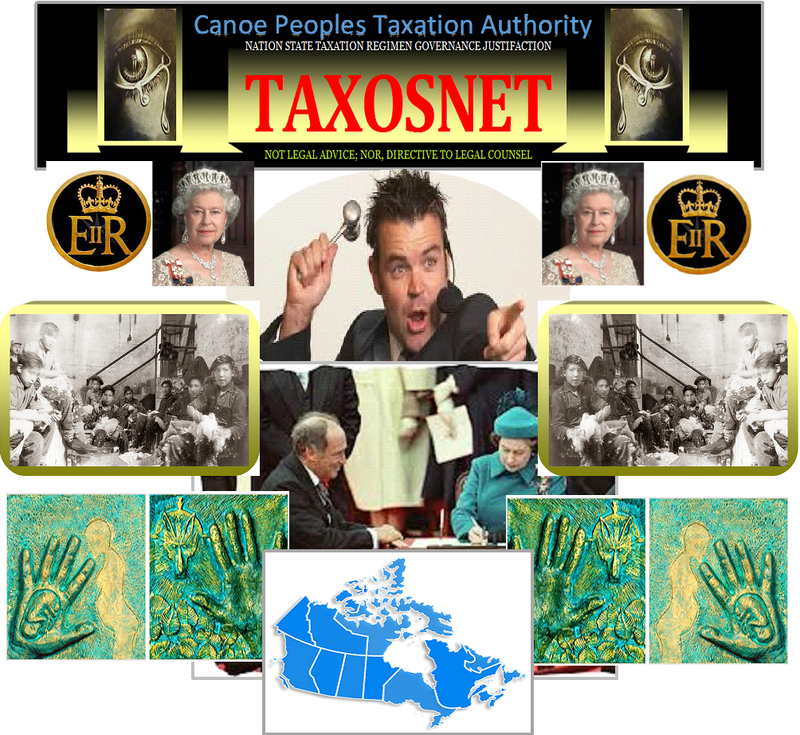 The twisted "forked tongue" EIIR Canada Ship's practices are constant; and, confirm the substantive right of governance claim of the CSSP / Canoe Peoples' non-diminished, non-acquiesced, non-conquered, not abandoned right of governance ... And, therein, resides the subsequent CSSP "Taxosnet" Auction of the "Crown EIIR Canada Ship's, et al, assets. International vending of nation state's debt load is a common practice; i.e., witness the EU's negotiations with Greece. 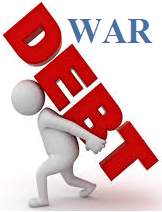 The U.S. $19.9 Trillion debt load is another matter of similar issue;and, exemplifies why a nation's debt is synonymous with the size of its military budget. 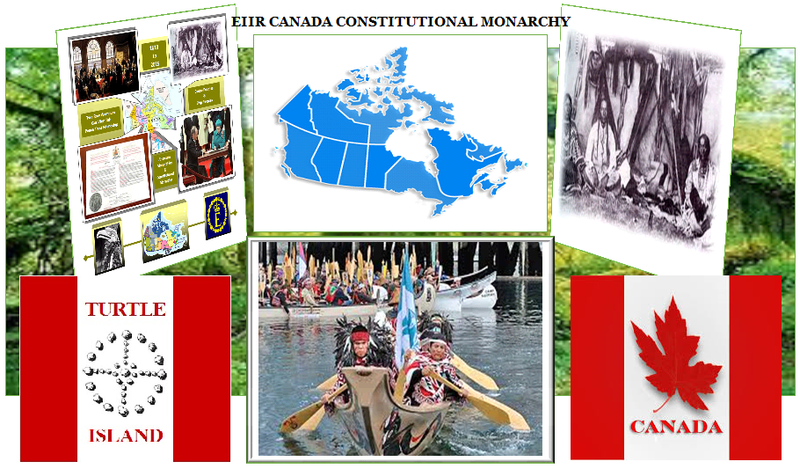 The continued "reverse onus" political position maintained by EIIR Canada Ship against the CSSP Statements of Claim for Reconciliation; including, remediation to the historical customary and traditional governance, is an evident breach of Elizabeth II's Coronation Oath; which included her commitments to "honour the customs and traditions of all of the peoples of her dominion ... in justice and mercy ... so help her, God". 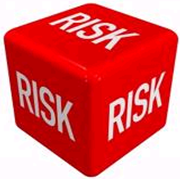 There are substantial scholarly examinations of the judicial cause for prosecution in the event of breach. 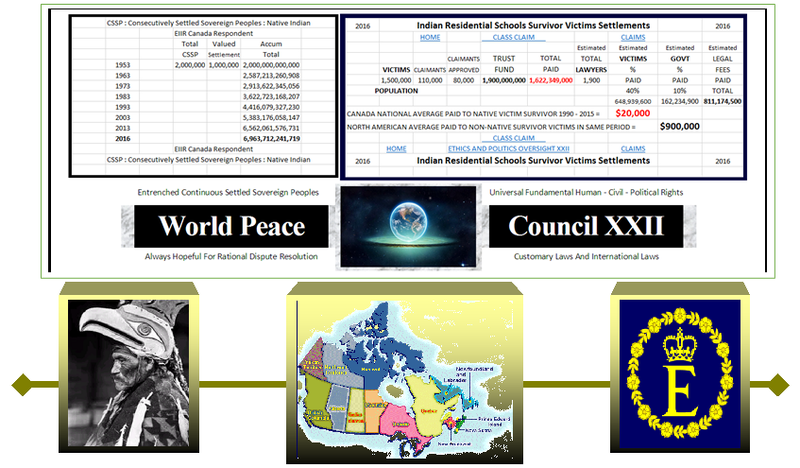 The 2005 Petition to Elizabeth II to, forthwith, provide adequate state-funded competent legal counsel to CSSP in matters before court has been ignored by EIIR Canada Ship; resulting in continued prejudicial CSSP incarcerations ("the new residential schools"). It becomes a matter of convenience for all citizens of a particular nation state or territory to develop a form of continuous governance; one that prescribes rules of order that are available to all citizens within that particular geographic boundary; avoiding jingoism. 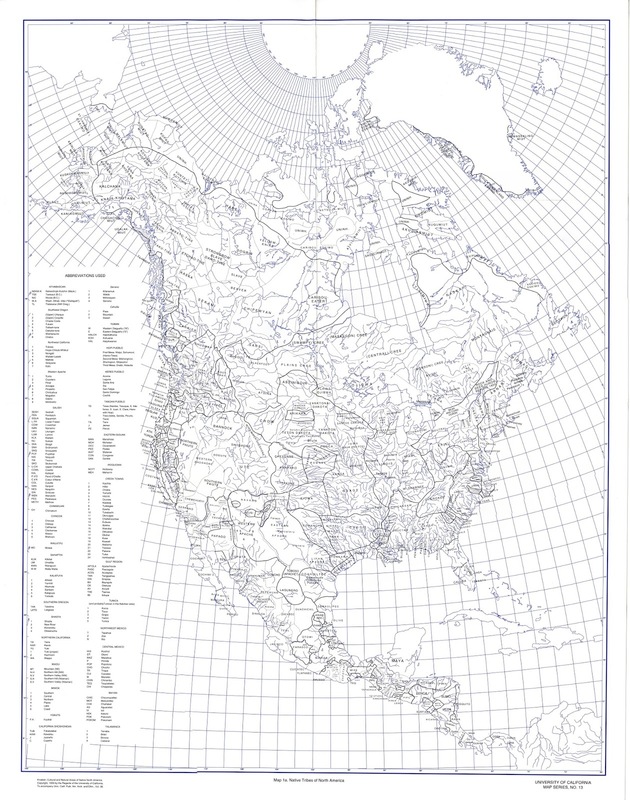 The EIIR Canada Ship's CSSP First Nations interactive Map illustrates some of the 650 CSSP locations north of the 49th Parallel ... more than 50% of the 1100 CSSPs in Turtle Island North / North America since time began more than 13,500 years ago on these continents following the last great Ice Age. 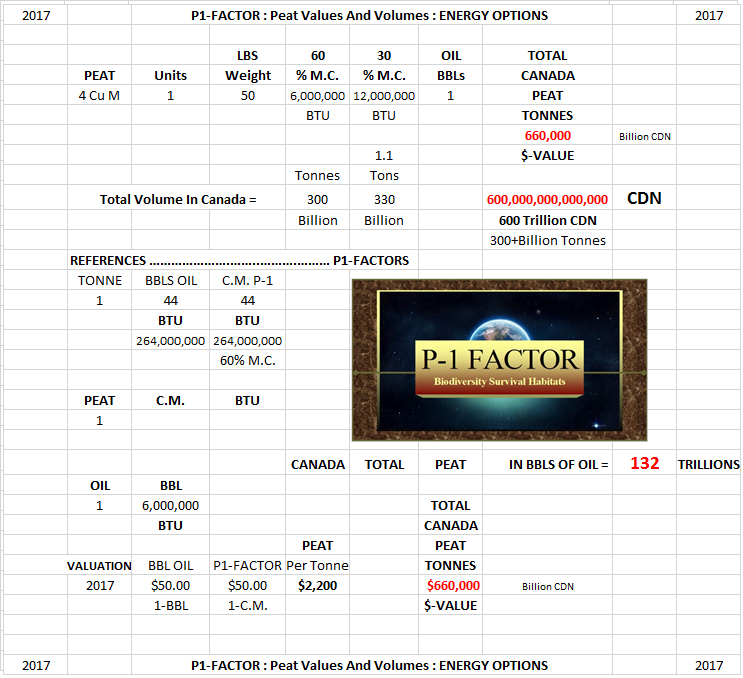 Taxosnet's publication regarding the scheduled auction of EIIR Canada assets establishes the proposed protocol that will be published as the specific auction call. Crimes Against Humanity & War Crimes Acts are now unfolding to gather the catalogue of breach allegations. 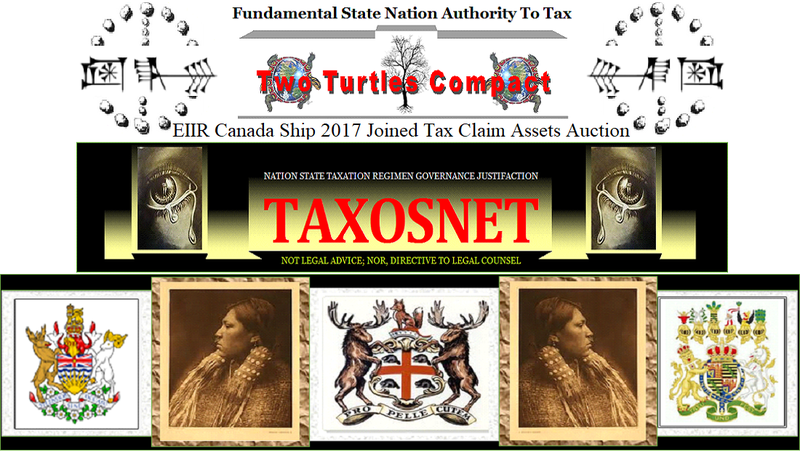 The justified "taxosnet" vending of the accumulated unjust wealth of the Ship Peoples (EIIR Canada) contrary to the conditional landing rights and the Hudson's Bay Company Charter, as stipulated through (territorial wide) Two Row Wampum / Gus Wen Tah / Peace Trust Friendship Covenant Chains has commenced following July 1st, 2017. Records must be preserved. 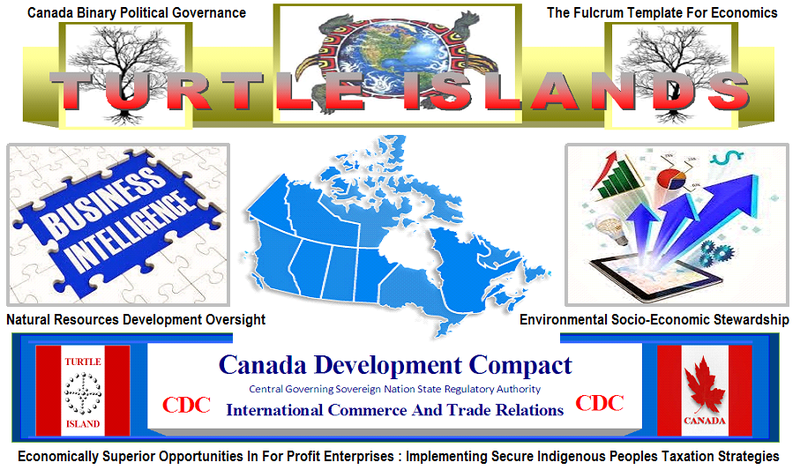 Forthwith autonomous CSSP paramount governance to manage the conditional EIIR Canada Ship landing rights in all Turtle Island North territories currently claimed as "Canada"; including, issues of homeland security and general domestic policing. 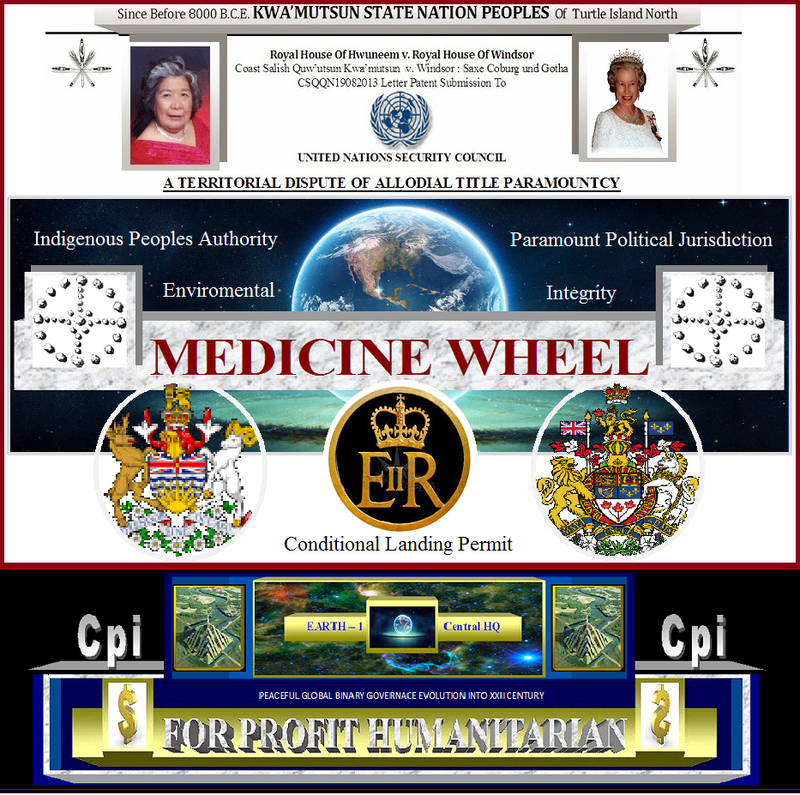 That EIIR Canada Ship shall enter into trade relations agreements with the CSSP, forthwith; as supervised through and international tribunal composed of 13 actors equally drawn from indigenous Peoples in the global community and the United Nations membership; with the thirteenth member sitting as chairperson, blindly drawn from an assembly of interested jurists. Summary, it is contrary to the fundamental principles of human justice and dignity for the continued, barbaric EIIR Canada Ship administration to compel CSSP to comply with the preponderance of their illegitimate governance claims. These said claims constitute criminal acts under the CSSP Crimes Against Humanity and War Crimes legislation. 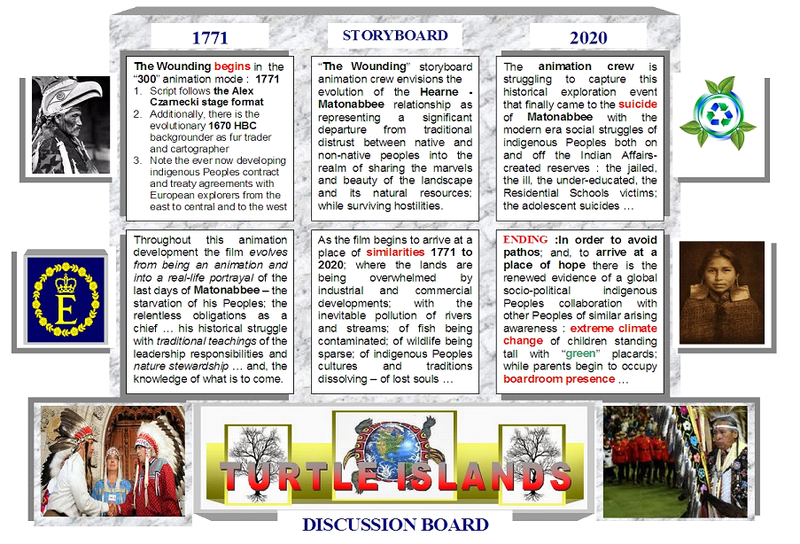 And, through the integration of the historic Jigonhsasee Great Peacemaking Silver Covenant Chain there is a vision for hope that will provide a clear environment for all Peoples choosing to reside in Turtle Island North and South to generate societal provisions for all cultures and traditions to survive and flourish in a respectful manner. 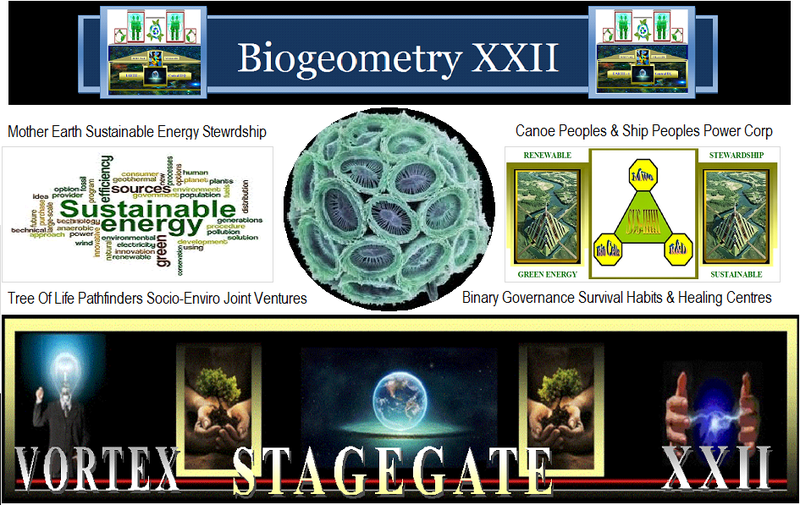 The acceptable and lasting peaceful resolution of the CSSP taxosnet claim upon EIIR Canada Ship shall become a template for other global communities to structure similar peacemaking covenants on behalf of Mother Earth and all life forms, therein. The modern era evidence of hostile military occupancy is evident through the dossier of complaints at the United Nations regarding breaches of its Charter, Chapter VII; and, is further illustrated through the prosecutions at the UN ICC and the UN ICJ. Elizabeth II, as the reigning monarch of the historical British Commonwealth - like Pope Francis of the Holy See - is bound by international covenants and their individual Oaths of Office to comply with the advancing social contract now recognized through the Free Prior Informed Consent Doctrines. Voluntary settlement with the Joined Claim is preferable to the available alternatives. Healing through the Moss Lady Prayer is always possible and available. 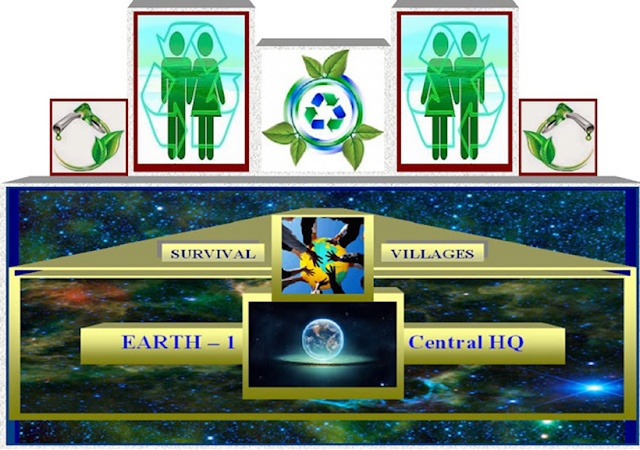 And, the Mother Earth Stewardship Agreement is a predicated prerequisite to Earth survival; and, the avoidance of Evictions. Malthusian Economics are not consistent with modern Social Contracts. Huy'ch'qu' / Miiqwich, Thank You / Merci. 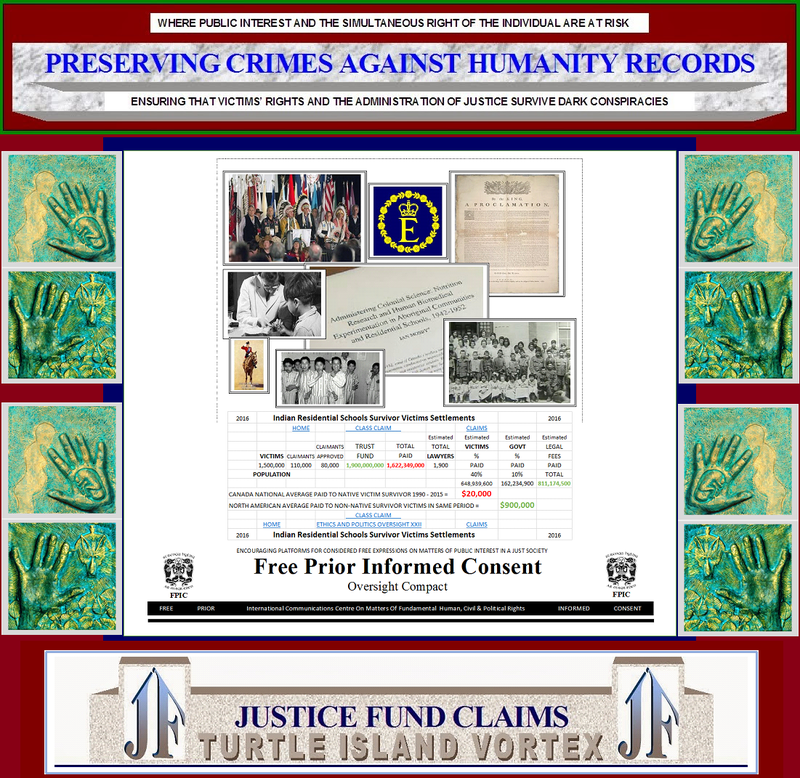 According to the preserved archives of the HBC Board of Directors, it was the encouraged past practice to negotiate trade agreements with the Turtle Island North Peoples through alcohol; today these strategies continue to influence "reserve" Peoples through unemployment, internal street gang violence vending drugs and intoxicants into the desperate communities; which inevitably produces accelerated youth suicides; and, through loss of individual property rights vast populations migrate into the non-reserve cities - which now has caused another EIIR Canada Ship national commission to investigate and report back to parliament on these continuous murders and disappearances of indigenous CSSP women and girls (MMIWG) ... more than 1200 confirmed since year 2000 MMIWG Fact Sheet (2010) - (2017) NWAC-Native Women's Association Of Canada. There is no shortage of documented policing investigative information. And, an international analysis of these tragedies leads one to assess these matters to be manifestations similar to wartime "comfort women" strategies by a "brotherhood" of conspiratorial colleagues of influence. What IS The Difference Of Manitoba Seizing 9000 Indigenous Children From Their Parents In 2016 To The ISIS Seizing Of Children For Child Brides ? 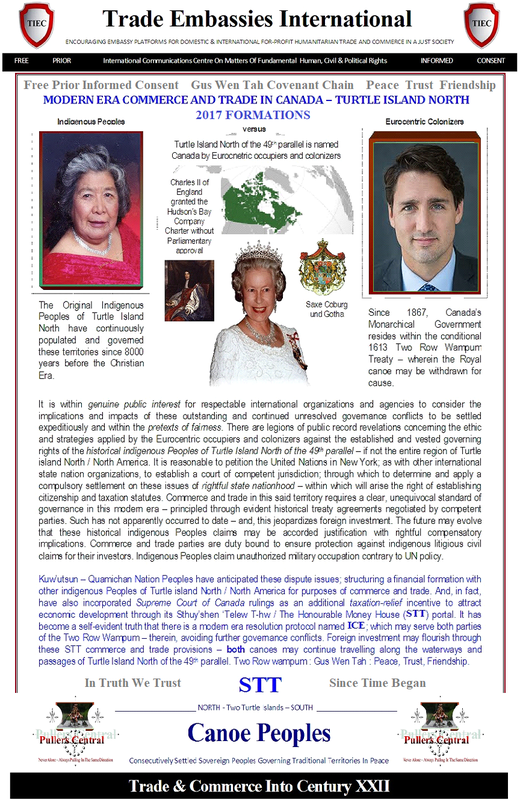 Kwa'mutsun Nation Announcement : Crown Canada at British Columbia does not possess rightful or legal governing authority to impose education policies that are not endorsed through indigenous Peoples Free, Prior Informed Consent as required by Custom Law and traditional international doctrines. Stitumaatulwut Hwuneem - Kwa'mutsun Nation Head of State - has directed information to be released to all interested parties on these impending matters of education policies and practices in British Columbia : Education Policies only via Free, Prior, Informed Consent.